Tomorrow, May 10th, is International Migratory Bird Day, and you may be worried that your expertise in diatoms or turbulent mixing just won’t cut it at the big ornithology party tonight. Well, UNdertheC is looking up and so is your evening, because we are here with a snapshot of a bird impressive enough to entertain the most ardent ornithologist (and, if you’ve spent much time with bird people, you know that’s pretty much all of them). The bar-tailed godwit shocked the science world in 2008, when Robert Gill et al. published a study on its migration patterns (available via open access here). Most articles summarizing Gill et al.‘s findings open with amused comments on the bird’s completely commonplace appearance, because the godwit doesn’t look like a record-breaker. 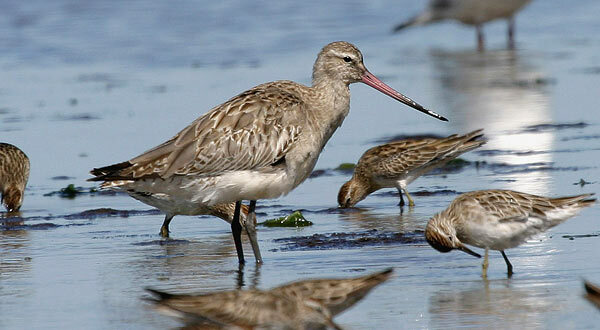 With a long beak and subdued colors, the godwit resembles any other bird hopping along the wrack zone. But the godwit doesn’t linger onshore for long: every fall, it flies for about a week straight, covering a distance of approximately 11,000 km between Alaska and the South Pacific. The bird doesn’t stop for food or water, and sleeps by shutting down half of its brain at a time. This equates to a human running approximately 43 mph for a solid 7 days. The bar-tailed godwit. Isn’t it cute? Image from the Melbourne Museum (Australia). Such a feat would obviously be unimaginable for us. A previous study by Gill et al. (2005) had found that godwits’ metabolism during migration was 8-10 times higher than their resting metabolic rate. In comparison, Tour de France cyclists can achieve a sixfold increase in baseline metabolism, the record for humans. Godwits’ success depends at least partially on fundamental physical changes that occur before and during migration. They spend their summer pigging out on clams and worms in Alaska, increasing their fat content by up to 55%. To build up muscle mass, they simultaneously decrease the size of their liver and intestines by 25%. Although puffed up with fat when they depart the shores of Alaska, godwits will burn it all off during migration. Gill et al. do not believe that these adaptations entirely explain godwits’ unparalleled stamina, and, in true scientist style, suggest that there are ample future research directions for this topic. The flight paths of nine bar-tailed godwits tracked by Gill et al. 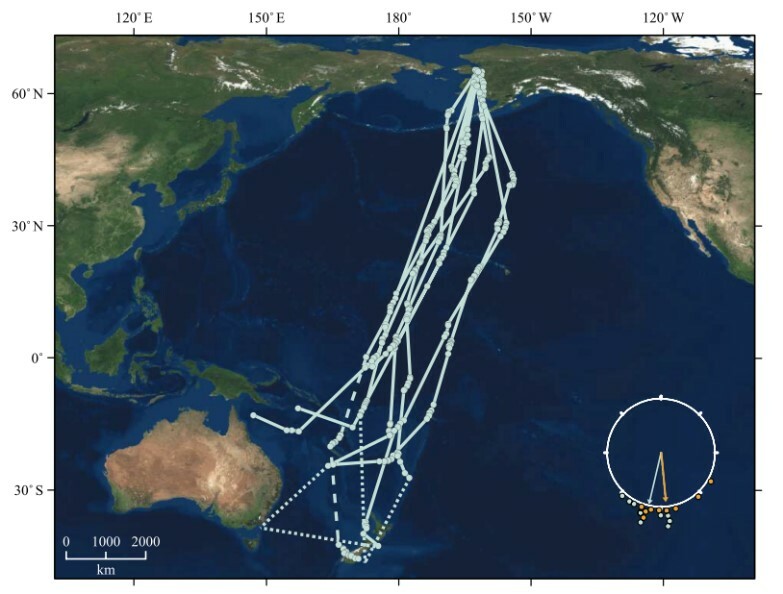 The birds flew from Alaska to the South Pacific between late August and early October. Image from Gill et al. 2008. Why hadn’t we recognized the flight of the godwit before? The success of Gill et al.‘s study lies partially in technological advances. Godwits weigh about a pound and a half before migrating, so the addition of a normal tracking device would be substantial relative to their body weight. Gill et al. used satellite transmitters known as PTTs (Platform Transmitter Terminals) that were implanted in female birds and attached to the lower backs of male birds. When a tagged bird departed Alaska, the transmitter was no more than 7.5% of its body mass, although that percentage would increase as the individual lost weight. However, the ratio was still low enough for the researchers to be convinced that they were not impeding the bird’s flight. The PTTs allowed one female godwit to achieve world-record designation: she traveled 11,680 km for 8.1 days straight, eventually arriving in New Zealand. Gill et al. realized that this sounds absurd: why wouldn’t the bird stop along the way? The researchers tried modeling other options for the journey between Alaska and New Zealand, using the same energy expenditure but adding stopovers and changing the initial amount of body fat. They found that the only scenario that used less energy than the oceanic flight required five to eight snack breaks on land, raising the total distance traveled to about 16,600 km. By traveling exclusively over the ocean, godwits maximize their time, evade predators like the peregrine falcon, and avoid land-based pathogens that could be especially dangerous to their stressed systems. Because godwits have ready access to food in Alaska, they are well-fueled for their migration and would likely have to change their digestive patterns if they ate in-flight. With better tracking technology, we’re likely to continue to make surprising discoveries about our feathered friends. Until then, go out and impress the migratory bird world with some godwit trivia!